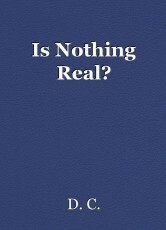 Is Nothing Real?, poem by D. C.
I was questioning a lot of things in my life at this time. Floating through time, Not knowing where to go, Nothing makes sense. There is no escape, Time is burning slow, Life is no longer relaxed, only tense. Feeling that I don't belong, On the outside looking in, Life is a never-ending song. I want to make it go away, Knowing that I can't, Bad vibes, forever finding a place to stay.